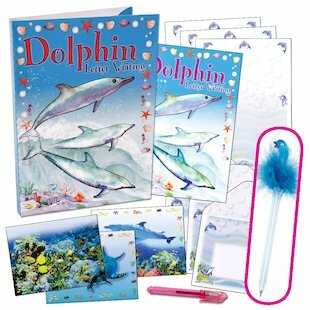 Playful dolphins make all your letters sparkle like the sea! See them dive, prance and leap the cresting waves! If you feel more at home in the sea than on land, or if you love to prance and pirouette with dancing dolphins, use this pack to send a refreshing blast of sea-spray to your friends. With sea-splashed motifs on all the letters and envelopes, plus colourful postcards and sticker stamps too, this gorgeous stationery helps every letter you write to deliver a breath of fresh air! Contents: folder with 24-page booklet, 16 notelets, 16 envelopes, 6 postcards, pencil and sticker stamps, plus FREE fluffy dolphin pen.